This Pink Chalkboard Marker is Like Liquid Chalk! This Modern Writing Tool Features a Small Tip for Precise Messaging. This Pink Chalkboard Marker Should Be in Every Marketer's Toolkit! Thin tip for precise messaging and drawing! Messages enver run because ink dries quickly! Can even be used onw rite-on LED signs! 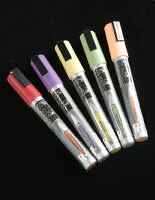 Each of these tools, such as this fluorescent pen has a bullet point for precise messaging and drawings. 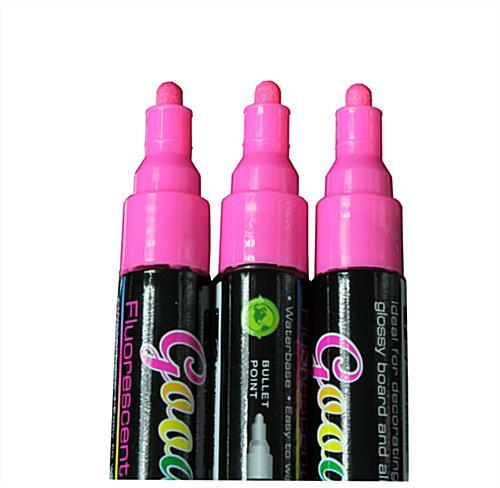 This pink chalkboard marker is non-toxic, so it can be used in a classroom around children! 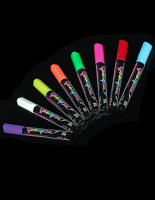 This 1/16" fuorescent pen works well on write-on LED boards that are menus. This pink chalkboard marker works on other non-porous surfaces like windows, glossy boards, and glass. 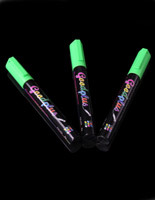 This neon writing tool is shipped in a 3-pack so merchants will have a back-up supply of ink. This pink chalkboard marker dries quickly so messages stay clean and neat. This tool, like a fluorescent pen leaves no residue, unlike dusty traditional chalk! Just damp cloth to clean the surface and write a new message! This pink chalkboard marker is shiny when pressed onto a surface, which draws the eye of new patrons. Typically, writing tools like this one are used in cafes, bars, restaurants, retail stores and auto showrooms. 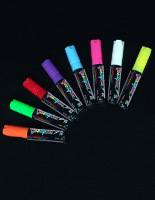 This pink chalkboard marker is a color stick that is water based. Don't use this neon pen outside in the rain or the ink will wash off! Ink that will dry fast on a board ensures the message will stay put until it's time to clean it off and write a new message with this fluorescent pen tool. 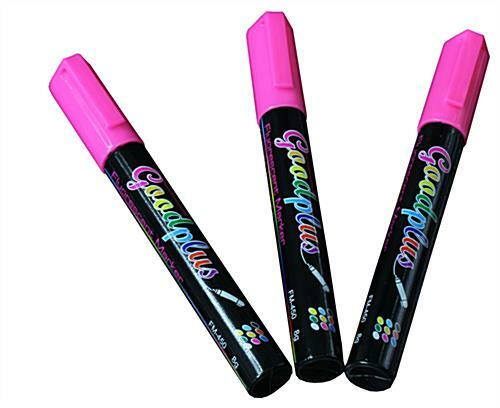 Try this pink chalkboard marker on a glossy black surface and watch your advertising pop!